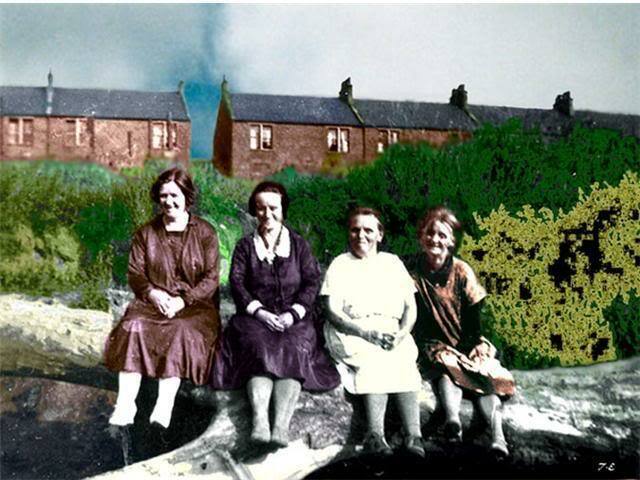 Fin Me Oot was the name given to a small miner’s village located on the banks of the Rotten Calder, a tributary of the River Clyde. The village’s formal name was Caldervale. However, in its latter years, after the demise of mining in the area, its location meant it was not easily found by visitors, and this may be how the name Fin Me Oot came to be associated with it. Anecdotal accounts relating to the name suggest its use only began after mining ceased. By repute, the village was still extant in 1959 and the date of its last occupation is known to be 1962. The records of AG Moore & Co, owners of the Blantyreferme Mine near Uddingston (which employed 456: 386 underground and 70 above), show the mine owners’ houses in Blantyre Parish were located at nearby Blantyreferme, and Caldervale, which had 40 two apartment houses with sculleries, occupied by 56 miners, at a rental of £9 2s (£9.10). Erected under the Building By-Laws – Two blocks – Two storeys in height – Walls hollow built- plastered on solid – Wood floors, ventilated – Internal surface of walls and ceilings good – No overcrowding – Apartments good size. No garden, ground available but not fenced – no wash houses – have cellars. At Caldervale a water closet has been provided in each house, placed inside the existing scullery, and pail privies have been abolished – Inside sinks, with gravitation water – Drainage treated at a private purification installation – Scavenged at owners’ expense. – The Housing Condition of Miners. Report by Medical Officer of Health, Dr John T Wilson, 1910. A gated access road leads to the site off Blantyreferme Road, and can be found south of the Clydeway Golf Range, after passing through a railway bridge with a narrow underpass controlled by traffic lights. The access road slopes down to the area shown in the approach picture, where the bench and sign can be seen in the vegetation on the right. The bench faces the area where the houses would have been found, accessed by the road leading off to the left of the picture. The sign pictured on the pole can be found down this road. Visiting the site also explains the adoption of the name Fin Me Oot. From Blantyreferme Road, the access road curves downhill and to the left, giving no view or indication of the existence of the houses. Even when approaching them down the track, their location down another road to the left (opposite the bench) means they remain invisible until you draw level with the road, and turn to face them. The main track is actually part of the Clyde Walkway, and carries on past the bench, through a rail underpass, where it takes a sharp left turn and carries on to the Rotten Calder, which feeds the River Clyde. A restored pedestrian bridge crosses this tributary, leading on to a stone and brick path which continues up the banking to emerge in a clearing. Nothing of interest remains, other than a small bing (pile of waste material or spoil from the former mining operations). In 2005, part of the site was used as a works compound by a contractor working for Network Rail, carrying out repairs to the Rotten Calder railway tunnel. The works were still underway in 2006 when these pictures were taken. The bench and signs pictured have survived for a number of years, and appear to have been unaffected by the works. The sign on the seat was noted to have been updated after the works were cleared, when seen again in 2009.